Welcome to my opensource free BMS thread. Specs for Modules are as follows. Approx Parts Cost inc pcb $5.00 each. One slave module per Lithium Cell. Supply/Cell Voltage 1.75 - 5.00V DC. Average Supply Current at 3.35v <1ma. Voltage Ref LM 385 1.235V accuracy 1% Supply/Cell. Voltage sensing maximum accuracy +/- 20mv. Maximum balancing/bypass current with 15R resistor 333ma at 5.00V. Maximum Serial Master Bus data rate 9600 baud. Maximum cell Capacity 65ah. Can be increased to 650ah. Maximum 256 Slave Modules per Master Module. Slave CPU Speed 8mhz with internal resonator. Permitted Working Cell Voltage Range 1.75 - 4.30V. Approx Parts Cost inc pcb $100.00 each. One Master module per complete system. Supply Voltage 8.00-30.00V DC or as limited by 5.00V 78L05 regulator. CPU Speed 8mhz with internal resonator. Average Board Supply Current at 12.00v <100ma. Maximum Serial Master Bus data rate 9600 baud. Maximum Charge/Discharge rate depends on current sensor used. Battery Pack Temp Sensor Range (-25 to +100C). Composite Video Display data rate 9600 baud (SV2000 Video Chip). Composite RCA Video Monitor Output 1V 75ohm PAL/NTSC. Charger relay output is board supply voltage max 30v at 500ma. Opto Isolated Charger/Controller Cutback outputs max 50ma 50v. The Video display is limited to 16x9 characters in a 0-15 & 0-8 matrix. Early test run of Slaves & Master with display from 2008. 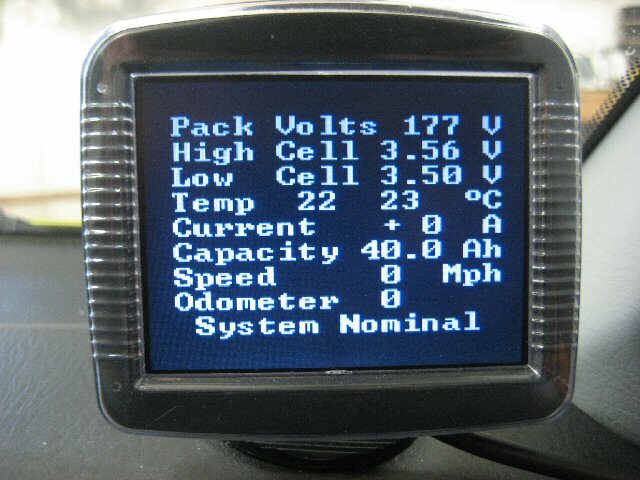 Latest software display showing various info. Youtube BMS Tour Videos. Note there are several available from 2008. This BMS thread has now grown a bit too large, so I'm am starting two additional threads to run alongside this one. This BMS General thread contains all the work/discussion upto 15/06/09. The BMS Hardware thread will contain any new work/discussion related to the hardware. The BMS Software thread will contain any new work/discussion related to the software. I hope this makes it a bit more manageable. New readers should work through the General thread first until they reach 15/06/09, they should then look at specific hardware/software/general threads for further info. This Open Source BMS thread has grown dramatically over the last few months. Appologies for that, and to the BVS for using their bandwidth!. There are now a number of other helpful and knowledgable contributors Thanks to them for their hard work and support. The system is up and running in analogue mode in two UK vehicles now, Greg Fordyce's Fiat 126 EV, and my own PHEV Honda Insight. I hope to complete a further upgrade to my digital version with Master/Slave configuration and data display screen shortly. It's also being adapted and tested by several other contributors. To help visitors the latest software/schematics etc will now be updated/available here as a zip archive below. Please note carefully version numbers for software and firmware requirements. We/I make no claims about safety/effectiveness/reliability of this system. It's just one of the many possible solutions now available for the management of EV batteries, and the standard disclaimer below applies. This BMS carries no warranty or guarantee of any kind! It's used at your own risk, and I make no claims as to suitability for a particular function. Prospective users must evaluate the system before using it, and no liability will be entertained by anyone in any shape or form whatsoever. The modules and software have been produced at low cost for the benefit of the EV & electronic community. The software is available free via the internet. Users may modify or adapt the system as they see fit. 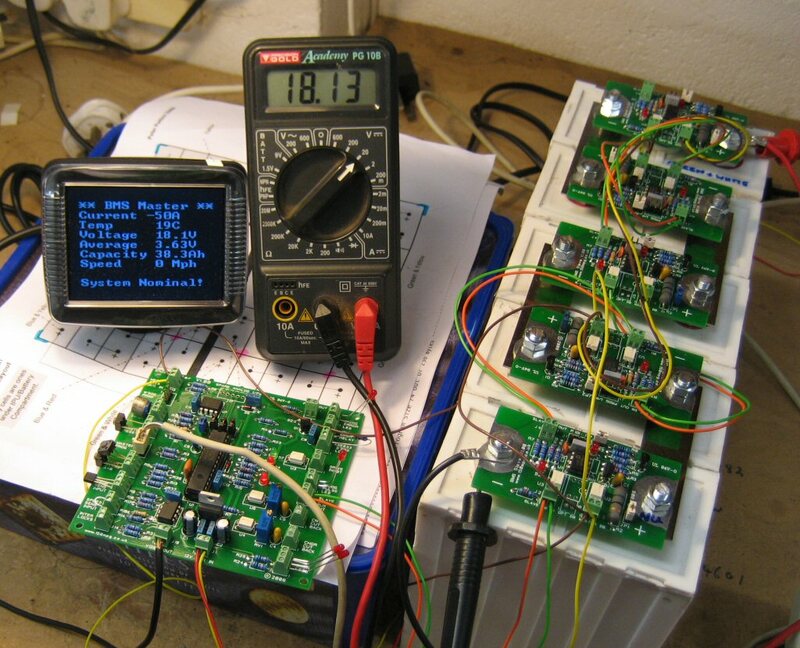 If you are not fully competent to work on potentially lethal battery systems and high voltages, then do not experiment with or use this system. Be aware that vehicle modifications can lead to invalidated insurance and warranty issues. You the end user remain fully liable for any modifications made to your vehicle. I thought I would start this thread to pull together BMS (Battery Management Systems) ideas for our projects, especially as a lot of us are currently investing in expensive Lithium Cells. Now my ideas below won't be new I'm sure, and I hope everyone will contribute their own freely. I've been dabbling and experimenting over last few weeks, and I do like the idea of an intelligent expandable BMS. Appologies in advance for my schematic skills, I could also only export the diagrams to a bmp file. but we have to draw the line somewhere for the sake of reproducability, practicality and cost. I would like to know the cell V and temp, the pack capacity and voltage etc. I've come up with a digital solution here which has many functions, only limited by the programmers collective ingenuity (Thats all of you ). This uses a Picaxe 08M or (12F683 pic) 8pin chip on each cell at a cost of about Ã‚Â£2.00. (pcb and discrete components extra of course but if we could get it down to Ã‚Â£5-8.00 a cell that's not bad.) Each cell is going to be fitted with one of these small circuits. 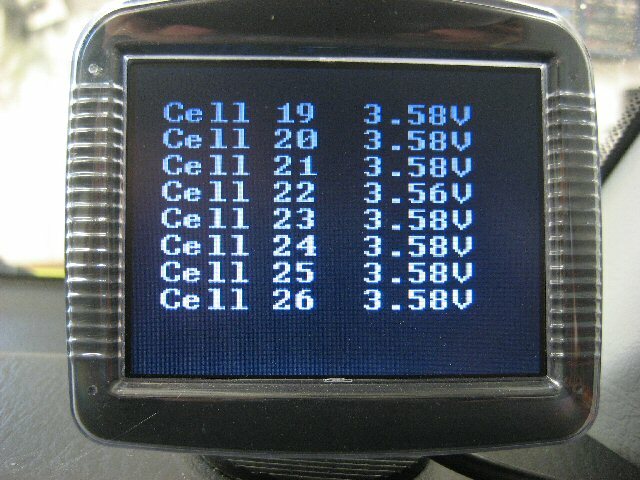 The pic has a wide operating voltage from 2-5.5v so covers virtually all the various types of Li-Ion chemistry. It sits there 24/7 (need to keep the current drain to a minimum) running a cell monitoring program checking the cell (subpack) voltage against it's reference. It's also checking the cell temp, and activating it's balancing load if the cell goes over Max V. Now this idea uses an opto isolated serial bus for comms with the master PIC and dashboard display. All the serial opto outputs are connected in parallel so the cells have a common data bus. The master pic pulls the interupt opto of cell one high and triggers an initial delay of say 0.1 seconds in the slave pic, the slave then starts the serial data output routine which dumps the cell data onto the bus for the master to receive and record. The act of data transmission triggers the interupt on cell two which waits for 0.1 seconds and then transmits it's data, add infinitum along the pack. The master recieves and checks all the data (Missing data can simply trigger an alarm condition etc) it then acts on data as reqd, calculating pack voltage from sum of cells, checking for over temp condition, etc etc etc. Note on the first cell in the pack the master PIC would be connected to (pins 1 and 2) of the interboard connector to initiate the interupt sequence, the cell 1 slave would then connect it's output (pins 3 and 4) to the input (pins 1 and 2) of the next slave. Hope that makes sense, like a cascade effect. Bit of work to do on timing of data etc and all slaves must run the same software. I'm off on hols now for a couple of weeks, I'll take a few schematics and have a further think. More ideas very welcome. setint %00001000,%00001000 `Reset the interrupt and wait for another data request. return `Return from interrupt to main program. Once everything is working as reqd I could probably buy a job lot of the bare slave PIC's and program them in assembler with the final code. The Picaxe basic is nice and easy for development though and can be simulated using Proteus VSM software. So any experts on schematics and pcb development want to lend a hand Come on down! I'm going to make up three slave boards when I get back from hols and clag them onto three of my old TS cells, I'll fire them up and see how the idea works in practise. I don't really see any major limit to the number of cells/slaves you could have except time taken to poll them all may become excessive or the parallel leakage of the data opto may become an issue. I think a pack scan rate of once a second if I can acheive it would be good. Last edited by retepsnikrep on Wed Jun 23, 2010 5:50 pm, edited 28 times in total. Sounds like we're both thinking along similar lines Peter! some of the 8-pin PICs (there is one model that had a built-in AtoD). boards laying out and software written for it - I can help! including ones that are double-sided and will fit an M6 through-bolt. the Supra, so it'll have to make do with PbA for the moment..
OK Richard sounds like you should have it all done in five minutes then If you feel like laying out that initial design on say 5 miniature pcb's as samples I can experiment with that save me a lot of work with veroboard I'm happy to pay for samples. I've specced up the outline for a very basic test board which will fit on my new cells and my old TS ones. See diagram. The darker grey areas are solder pads for the cell terminals onto which the pcb mounts. By keeping all the components in the centre part users could simply hacksaw off the ends if there application did not need the outer holes (Me for instance) or it was too long to fit on their cells . Also if you want to convert my rudimentary code above into assembler for the 12F683 pic that's even better. Picaxe 08M or 12F683 pic datasheet. Last edited by retepsnikrep on Fri Jun 06, 2008 7:58 am, edited 2 times in total. That's certainly comprehensive but they really like multiplexing and chips with huge numbers of inputs, I prefer the one simple circuit per cell approach, infinitely scaleable in theory for our massive cells. I haven't decided how I am going to adapt them yet but they have a control chip on them that might be able to be replaced with a picaxe-14M. I will post pictures when I get them and maybe a simple circuit diagram when I have time. You might need to be signed up to the thundersky group to view, not sure. My idea is that it may be possible to adapt these into a slave board that handles say maybe 8 or 12 cells each and then have them comunicate with a master as per Peters suggestion. Not as flexible as Peters but maybe better for larger strings? And if by some miracle the pic could be soldered straight in it could be a simple solution. I'm well into the design of a very similar system, with an overall controlled current source charger & local shunt regulators on each cell. I reckon the components cost per cell will be around Ã‚Â£2. I'm using AVR ATtiny44 micros - SO14 package & a fairchild RFP12N10L FET for the shunt reg. That's similar to the way which I have been doing it. Initally trialled on Lead acid cells, I received my tired and unbalanced lithium cells for testing purposes and managed better than the preferred 0.5% accuracy on charge voltage. Last edited by ChrisBarron on Mon Jun 09, 2008 10:06 pm, edited 1 time in total. port pin. A simple series resistor (100 ohm, or 1k ohm) takes care of this. 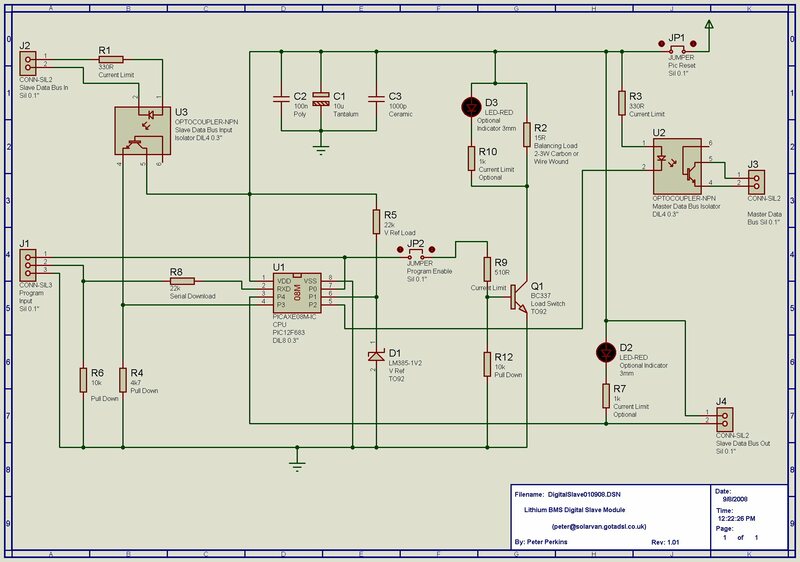 Is the LM385 reference diode the right way around? C compilers, been a while since I resorted to assembly! up if the cell volts drops or if it's talked to by the master? work ok with this small size board. and an analogue comparator module (the PIC12F683). I've just realised that's the chip the PICAXE module is using!